HORÆ PAULINÆ by WILLIAM PALEY, D.D. HORÆ APOSTOLICÆ by REV. T. R. BIRKS, A.M. The HORÆ PAULINÆ, ever since its first appearance, has maintained a high and deserved reputation, not only as a decisive argument for the genuineness of St. Paul’s epistles, and the fidelity of St. Luke’s narrative, but as a pattern of sagacious and discriminating historical criticism. The strong proof deducible from undesigned coincidences between separate documents, to establish their authenticity, though it must have been felt by many, and may have been partially traced by others in this very case, had never before received so striking a development. No candid reader, after a perusal of the work, can escape the full conviction that the Acts of the Apostles, and the epistles of St. Paul, forming together nearly one half of the New Testament, could neither be the result of fraud on the part of contem­porary authors, nor have an artificial origin in later times, but are certainly what they bear upon their face, a genuine history, and authentic letters of the great apostle of the Gentiles. The present edition of the work embraces several distinct, but kindred objects. First of all, it has been endeavoured to offer such partial corrections of the original treatise, as further study of the subject, aided by the light of more recent criticism, appeared to require. Secondly and principally, it seemed de­sirable to extend the argument still further, to glean many coincidences which Paley had overlooked, and to extend the inquiry to the Four Gospels. The HORÆ APOSTOLICÆ, which forms the second half of this volume, is the fruit of that design. Many par­ticular coincidences are there brought to light, from the epistles of St. Paul, including that to the Hebrews, from the book of Acts, and last of all, from the comparison of the gospels with the incidental statements of the letters, and with each other. Their peculiar character here imposed a limit, since the full development of their harmony would involve many inquiries, not easily reconciled with the form of Paley’s work, and the cumulative nature of the argument. These topics of evidences are reserved, if occasion should arise, for a distinct work; but the present volume embraces nearly all, in the editor’s judgment, that admits of being pre­sented in distinct articles, and in a popular form. Besides these objects, which refer to the conduct of the argument, it has been endeavoured, in agreement with the great purpose of the Society, under whose sanction the work now appears, to impress on the whole inquiry a practical tone. An intellectual con­viction, that the New Testament writings are genuine, is of little worth, unless their saving doctrines are im­pressed upon the heart. And though I have not thought it desirable, either in the notes or the added treatise, to digress frequently from the direct line of argument, I trust that the whole volume, with the reflections at its close, will commend itself not merely to the intelligence of every thoughtful reader but to the conscience and heart of the sincere Christian, and serve as a humble contribution to the spread of that knowledge of Christ revealed in his own word, which alone is able to make men wise unto salvation. Two works of a kindred nature have been consulted, in the composition of this treatise—Professor Blunt’s “Undesigned Coincidences,” which, although chiefly occupied with the Old Testament, include some remarks on the New, and Mr. Biley’s “Supplement to the Horæ Paulinæ.” The former work, highly valuable in the Old Testament portion, has offered me but slight aid in the present subject, as many of the coincidences there suggested appear to me to be either unimportant or untenable. Those which appeared of real value have been retained, with an acknowledgment of my obligation. The work of Mr. Biley, though I have been compelled to differ from several of his hy­potheses, is much richer in fresh materials. I have usually marked the coincidence, where our views agree, though my own conclusions, except in one or two instances, were formed independently. In other cases, I have felt it right to give the reasons for dissent from his views, as in the date of the Epistle to the Galatians. On the other hand, his remarks on the council, Acts 15 and the probable occasion of the First Epistle of St. Peter, appear to me both original and highly valuable. Some use, though more limited, has also been made of the “Continuous History of St. Paul,” by the late Canon Tate. Besides these, which are more nearly akin to the present volume in their express object, other critical works have been consulted and examined, especially Hug’s Introduction, Dr. Burton’s “Essay on the Book of Acts,” Greswell’s learned “Dissertations on the Gospel Harmony,” and that able and useful work, “The Literary History of the New Testament,” whose author, though well known to many, has preferred to conceal his name. Of these I have been perhaps the most indebted to Mr. Greswell’s valuable researches, though the accuracy of his reasoning, especially on points of chronology, by no means rivals the extent of his erudition. I have endeavoured to express my substantial obligations, without encumbering the volume by needless refer­ences and incidental discussions, in each case of par­tial agreement or disagreement. In compliance with the judgment of an honoured friend, I have closed the work by a chronological table, the result of my own investigations, and which there­fore appears to some disadvantage, apart from the ar­guments by which it should be sustained. Without pretending to a certainty which is hardly attainable, I feel a strong conviction that the dates, from the death of Herod onward, are within one year of the truth, and have given those which seem to me the most probable, within the limits prescribed by the evidence. The scheme of Dr. Burton, to which Mr. Biley refers as authority, is, in my judgment, illogical and erro­neous, and refuted by the very authorities on which the professor has chiefly relied. I am glad to perceive that the dates to which I have been independently led, agree very nearly with those adopted in the Literary History; but the writer does not state whether he has borrowed them from others, or deduced them by his own original inquiries. From his view, however, of the dates of St. John’s Gospel and the catholic epistles, I am compelled to dissent for many reasons. And now I commend the volume to the blessing of that gracious Lord, whose message of love and mercy it is designed to illustrate, in its irresistible claims on the faith, the reverence, and the practical allegiance, of every child of man, who, however unversed in ancient history, can read in his own tongue the inspired writings of the new covenant, and may there discern in every page, the traces of Divine wisdom, truth, and holiness. Kelshall Rectory, November 17, 1849. THE TRUTH OF THE SCRIPTURE HISTORY OF ST. PAUL EVINCED. The volume of Christian Scriptures contains thirteen letters purporting to be written by Saint Paul; it contains also a book, which, amongst other things, professes to deliver the history, or rather memoirs of the history, of this same person. By assuming the genuineness of the letters, we may prove the substantial truth of the history; or, by assuming the truth of the history, we may argue strongly in support of the genuine­ness of the letters. But I assume neither one nor the other. The reader is at liberty to suppose these writings to have been lately discovered in the library of the Escurial, and to come to our hands destitute of any extrinsic or collateral evidence what­ever; and the argument I am about to offer is calculated to show, that a comparison of the different writings would, even under these circumstances, afford good reason to believe the persons and transactions to have been real, the letters authentic, and the narration in the main to be true. 3. The history and letters may have been founded upon some authority common to both; as upon reports and tradi­tions which prevailed in the age in which they were composed, or upon some ancient record now lost, which both writers con­sulted: in which case also, the letters, without being genuine, may exhibit marks of conformity with the history; and the history, without being true, may agree with the letters. Agreement, therefore, or conformity, is only to be relied upon so far as we can exclude these several suppositions. Now the point to be noticed is, that in the three cases above enu­merated, conformity must be the effect of design. Where the history is compiled from the letters, which is the first case, the design and composition of the work are in general so con­fessed, or made so evident by comparison, as to leave us in no danger of confounding the production with original history, or of mistaking it for an independent authority. The agreement, it is probable, will be close and uniform, and will easily be. perceived to result from the intention of the author, and from the plan and conduct of his work.—Where the letters are fabri­cated from the history, which is the second case, it is always for the purpose of imposing a forgery upon the public; and in order to give colour and probability to the fraud, names, places, and circumstances, found in the history, may be studiously introduced into the letters, as well as a general consistency be endeavoured to be maintained. But here it is manifest that whatever congruity appears, is the consequence of meditation,, artifice, and design.—The third case is that wherein the history and the letters, without any direct privity or, communication, with each other, derive their materials from the same source; and, by reason of their common original, furnish instances of accordance and correspondency. This is a situation in which we must allow it to be possible for ancient writings to be placed; and it is a situation in which it is more difficult to distinguish spurious from genuine writings, than in either of the cases described in the preceding suppositions; inasmuch as the congruities observable are so far accidental, as that they are not produced by the immediate transplanting of names and circumstances out of one writing into the other. But although, with respect to each other, the agreement in these writings be mediate and secondary, yet is it not properly or absolutely un­designed: because, with respect to the common original from which the information of the writer proceeds, it is studied and factitious. The case of which we treat must, as to the letters, be a case of forgery: and when the writer who is personating another sits down to his composition—whether we have the history with which we now compare the letters, or some other record before him; or whether we have only loose tradition and reports to go by—he must adapt his imposture, as well as he can, to what he finds in these accounts; and his adaptations will be the result of counsel, scheme, and industry: art must be employed; and vestiges will appear of management and de­sign. Add to this, that, in most of the following examples, the circumstances in which the coincidence is remarked are of too particular and domestic a nature to have floated down upon the stream of general tradition. Of the three cases which we have stated, the difference be­tween the first and the two others is, that in the first the design may be fair and honest, in the others it must be accompanied with the consciousness of fraud; but in all there is design. In examining, therefore, the agreement between ancient writings, the character of troth and originality is undesignedness: and this test applies to every supposition; for, whether we suppose the history to be true, but the letters spurious; or, the letters to be genuine, but the history false; or, lastly, falsehood to belong to both—the history to be a fable, and the letters ficti­tious: the same inference will result—that either there will be no agreement between them, or the agreement will be the effect of design. Nor will it elude the principle of this rule, to sup­pose the same person to have been the author of all the letters, or even the author both of the letters and the history; for no less design is necessary to produce coincidence between different parts of a man’s own writings, especially when they are made to take the different forms of a history and of original letters, than to adjust them to the circumstances found in any other writing. With respect to those writings of the New Testament which are to be the subject of our present consideration, I think that, as to the authenticity of the epistles, this argument, where it is sufficiently sustained by instances, is nearly conclusive; for I cannot assign a supposition of forgery, in which coincidences of the kind we inquire after are likely to appear. As to the history, it extends to these points:—It proves the general reality of the circumstances; it proves the historian’s know­ledge of these circumstances. In the present instance it con­firms his pretensions of having been a contemporary, and in the latter part of his history a companion, of St. Paul. In a word, it establishes the substantial truth of the narration; and substantial truth is that which, in every historical inquiry, ought to be the first thing sought after and ascertained: it must be the groundwork of every other observation. The reader then will please to remember this word undesignedness, as denoting that upon which the construction and validity of our argument chiefly depend. As to the proofs of undesignedness, I shall in this place say little; for I had rather the reader’s persuasion should arise from the instances themselves, and the separate remarks with which they may be accompanied, than from any previous for­mulary or description of argument. In a great plurality of examples, I trust he will be perfectly convinced that no design or contrivance whatever has been exercised: and if some of the coincidences alleged appear to be minute, circuitous, or oblique, let him reflect that this very indirectness and subtilty is that which gives force and propriety to the example. Broad, obvious, and explicit agreements, prove little; because it may be suggested that the insertion of such is the ordinary expedient of every forgery: and though they may occur, and probably will occur in genuine writings, yet it cannot be proved that they are peculiar to these. Thus what St. Paul declares in chap. 11 of 1 Cor. concern­ing the institution of the eucharist— “For I have received of the Lord that which also I delivered unto you, That the Lord Jesus the same night in which he was betrayed took bread; and when he had given thanks, he brake it, and said, Take, eat; this is my body, which is broken for you: this do in re­membrance of me”—though it be in close and verbal confor­mity with the account of the same transaction preserved by St. Luke, is yet a conformity of which no use can be made in our argument; for if it should be objected that this was a mere recital from the Gospel, borrowed by the author of the epistle, for the purpose of setting off his composition by an appearance of agreement with the received account of the Lord’s supper, I should not know how to repel the insinuation. In like manner, the description which St. Paul gives of himself in his Epistle to the Philippians (3:5. )— “Circumcised the eighth day, of the stock of Israel, of the tribe of Benjamin, an Hebrew of the Hebrews; as touching the law, a Pharisee; concerning zeal, persecuting the church; touching the righteous­ness which is in the law, blameless,”—is made up of particulars so plainly delivered concerning him in the Acts of the Apostles, the Epistle to the Romans, and the Epistle to the Galatians, that I cannot deny but that it would be easy for an impostor, who was fabricating a letter in the name of St. Paul, to col­lect these articles into one view. This, therefore, is a confor­mity which we do not adduce. But when I read in the Acts of the Apostles, that when “Paul came to Derbe and Lystra, behold, a certain disciple was there, named Timotheus, the son of a certain woman, which was a Jewess;” and when, in an epistle addressed to Timothy, I find him reminded of his “having known the Holy Scriptures from a child” which implies that he must, on one side or both, have been brought up by Jewish parents: I conceive that I remark a coincidence which shows, by its very obliquity, that scheme was not em­ployed in its formation. In like manner, if a coincidence depend upon a comparison of dates, or rather of circumstances from which the dates are gathered—the more intricate that com­parison shall be; the more numerous the intermediate steps through which the conclusion is deduced; in a word, the more circuitous the investigation is, the better, because the agree­ment which finally results is thereby further removed from the suspicion of contrivance, affectation, or design. And it should be remembered, concerning these coincidences, that it is one thing to be minute, and another to be precarious; one thing to be unobserved, and another to be obscure; one thing to be circuitous or oblique, and another to be forced, dubious, or fanciful. And this distinction ought always to be retained in our thoughts. The very particularity of St. Paul’s epistles; the perpetual recurrence of names of persons and places; the frequent allu­sions to the incidents of his private life, and the circumstances of his condition and history; and the connexion and parallelism of these with the same circumstances in the Acts of the Apos­tles, so as to enable us, for the most part, to confront them one with another; as well as the relation which subsists between the circumstances, as mentioned or referred to in the different epistles—afford no inconsiderable proof of the genuineness of the writings, and the reality of the transactions. For as no advertency is sufficient to guard against slips and contradic­tions, when circumstances are multiplied, and when they are liable to be detected by contemporary accounts equally circum­stantial, an impostor, I should expect, would either have avoided particulars entirely, contenting himself with doctrinal discus­sions, moral precepts, and general reflections;* or if, for the sake of imitating St. Paul’s style, he should have thought it necessary to intersperse his composition with names and cir­cumstances, he would have placed them out of the reach of comparison with the history. And I am confirmed in this opinion by the inspection of two attempts to counterfeit St. Paul’s epistles, which have come down to us; and the only attempts, of which we have any knowledge, that are at all deserving of regard. One of these is an epistle to the Lao­diceans, extant in Latin, and preserved by Fabricius in his collection of apocryphal scriptures. The other purports to be an epistle of St. Paul to the Corinthians, in answer to an epistle from the Corinthians to him. This was translated by Scroderus from a copy in the Armenian language which had been sent to W. Whiston, and was afterwards from a more perfect copy procured at Aleppo, published by his sons, as an appendix to their edition of Moses Chorenensis. No Greek copy exists of either: they are not only not supported by an­cient testimony, but they are negatived and excluded; as they have never found admission into any catalogue of apostolical writings, acknowledged by, or known to, the early ages of Christianity. In the first of these I found, as I expected, a total evitation of circumstances. It is simply a collection of sentences from the canonical epistles, strung together with very little skill. The second, which is a more versute and specious forgery, is introduced with a list of names of persons who wrote to St. Paul from Corinth; and is preceded by an account sufficiently particular of the manner in which the epistle was sent from Corinth to St. Paul, and the answer returned. But they are names which no one ever heard of; and the account it is impossible to combine with anything found in the Acts, or in the other epistles. It is not necessary for me to point out the internal marks of spuriousness and imposture which these compositions betray; but it was necessary to ob­serve, that they do not afford those coincidences which we propose as proofs of authenticity in the epistles which we defend. Having explained the general scheme and formation of the argument, I may be permitted to subjoin a brief account of the manner of conducting it. * This, however, must not be misunderstood. A person writing to his friends, and upon a subject in which the transactions of his own life were concerned, would probably be led in the coarse of his letter, especially if it were a long one, to refer to passages found in his history. A person addressing an epistle to the public at large, or under the form of an epistle delivering a discourse upon some speculative argument, would not, it is probable, meet with an occasion of alluding to the cir­cumstances of his life at all: he might, or he might not; the chance on either side is nearly equal. This is the situation of the Catholic epistles. Although, therefore, the presence of these allusions and agreements be a valuable accession to the arguments by which the authenticity of a letter is maintained, yet the want of them certainly forms no positive objection. I have disposed the several instances of agreement under separate numbers; as well to mark more sensibly the divisions of the subject, as for another purpose, namely, that the reader may thereby be reminded that the instances are independent of one another. I have advanced nothing which I did not think probable; but the degree of probability, by which different in­stances are supported, is undoubtedly very different. If the reader, therefore, meets with a number which contains an instance that appears to him unsatisfactory, or founded in mis­take, he will dismiss that number from the argument, but without prejudice to any other. He will have occasion also to observe, that the coincidences discoverable in some epistles are much fewer and weaker than what are supplied by others. But he will add to his observation this important circumstance —that whatever ascertains the original of one epistle, in some measure establishes the authority of the rest. For, whether these epistles be genuine or spurious, everything about them indicates that they come from the same hand. The diction, which it is extremely difficult to imitate, preserves its resem­blance and peculiarity throughout all the epistles. Numerous expressions and singularities of style, found in no other part of the New Testament, are repeated in different epistles; and occur in their respective places, without the smallest appear­ance of force or art. An involved argumentation, frequent obscurities, especially in the order and transition of thought, piety, vehemence, affection, bursts of rapture, and of unpa­ralleled sublimity, are properties, all or most of them, discernible in every letter of the collection. But although these epistles bear strong marks of proceeding from the same hand, I think it is still more certain that they were originally separate publi­cations. They form no continued story; they compose no regular correspondence; they comprise not the transactions of any particular period; they carry on no connexion of argu­ment; they depend not upon one another; except in one or two instances, they refer not to one another. I will farther undertake to say, that no study or care has been employed to produce or preserve an appearance of consistency amongst them. All which observations show that they were not intended by the person, whoever he was, that wrote them, to come forth or be read together: that they appeared at first separately, and have been collected since. The proper purpose of the following work is to bring to­gether, from the Acts of the Apostles, and from the different epistles, such passages as furnish examples of undesigned coin­cidence; but I have so far enlarged upon this plan, as to take into it some circumstances found in the epistles, which con­tributed strength to the conclusion, though not strictly objects of comparison. It appeared also a part of the same plan, to examine the difficulties which presented themselves in the course of our inquiry. I do not know that the subject has been proposed or consi­dered in this view before. Ludovicus, Capellus, bishop Pear­son, Dr. Benson, and Dr. Lardner, have each given a continued history of St. Paul’s life, made up from the Acts of the Apos­tles and the Epistles joined together. But this, it is manifest, is a different undertaking from the present, and directed to a different purpose. If what is here offered shall add one thread to that compli­cation of probabilities by which the Christian history is at­tested, the reader’s attention will be repaid by the supreme importance of the subject; and my design will be fully answered. “But now I go unto Jerusalem to minister unto the saints. For it hath pleased them of Macedonia and Achaia to make a certain contribution for the poor saints which are at Jeru­salem,” Rom. 15:25, 26. In this quotation three distinct circumstances are stated—a contribution in Macedonia for the relief of the Christians of Jerusalem, a contribution in Achaia for the same purpose, and an intended journey of St. Paul to Jerusalem. These circum­stances are stated as taking place at the same time, and that to be the time when the epistle was written. Now let us inquire whether we can find these circumstances elsewhere; and whether, if we do find them, they meet together in respect of date. Turn to the Acts of the Apostles, chap. 20: ver. 2, 3, and you read the following account: “When he had gone over those parts, (namely, Macedonia,) and had given them much exhortation, he came into Greece, and there abode three months. And when the Jews laid wait for him, as he was about to sail into Syria, he proposed to return through Mace­donia.” From this passage, compared with the account of St. Paul’s travels given before, and from the sequel of the chapter, it appears that upon St. Paul’s second visit to the peninsula of Greece, his intention was, when he should leave the country, to proceed from Achaia directly by sea to Syria; but that, to avoid the Jews, who were lying in wait to inter­cept him in his route, he so far changed his purpose as to go back through Macedonia, embark at Philippi, and pursue his voyage from thence towards Jerusalem. Here therefore is a journey to Jerusalem, but not a syllable of any contribution. And as St. Paul had taken several journeys to Jerusalem before, and one also immediately after his first visit into the peninsula of Greece, (Acts 18:21,) it cannot from hence be collected in which of these visits the epistle was written, or with certainty that it was written in either. The silence of the historian, who professes to have been with St. Paul at the time, (chap. 20: ver. 6,) concerning any contribution, might lead us to look out for some different journey, or might induce us perhaps to question the consistency of the two records, did not a very accidental reference, in another part of the same history, afford us sufficient ground to believe that this silence was omission. When St. Paul made his reply before Felix, to the accusations of Tertullus, he alleged, as was natural, that neither the errand which brought, him to Jerusalem, nor his Conduct whilst he remained there, merited the calumnies with which the Jews had aspersed him: “Now after many years (that is, of absence) I came to bring alms to my nation, and offerings. Whereupon certain Jews from Asia found me puri­fied in the temple, neither with multitude, nor with tumult, who aught to have been here before thee, and object, if they had ought against me,” Acts 24:17-19. This mention of alms and offerings certainly brings the narrative in the Acts nearer to an accordancy with the epistle; yet no one, I am persuaded, will suspect that this clause was put into St. Paul’s defence, either to supply the omission in the preceding narra­tive, or with any view to such accordancy. After all, nothing is yet said or hinted concerning the place of the contribution; nothing concerning Macedonia and Achaia. Turn therefore to the first Epistle to the Corinthians, chap. 16 ver. 1-4, and you have St. Paul delivering the following directions: “Concerning the collection for the saints, as I have given order to the churches of Galatia, even so do ye. Upon the first day of the week let every one of you lay by him in store, as God hath prospered him, that there be no gatherings when I come. And when I come, whomsoever you shall approve by your letters, them will I send to bring your libe­rality unto Jerusalem. And if it be meet that I go also, they shall go with me.” In this passage we find a contribution carrying on at Corinth, the capital of Achaia, for the Christians of Jerusalem: we find also a hint given of the possibility of St. Paul going up to Jerusalem himself, after he had paid his visit into Achaia: but this is spoken of rather as a possibility than as any settled intention; for his first thought was, “Whomsoever you shall approve by your letters, them will I send to bring your liberality unto Jerusalem:” and in the sixth verse he adds, “That ye may bring me on my journey whither­soever I go.” This epistle purports to be written after St. Paul had been at Corinth; for it refers throughout to what he had done and said amongst them whilst he was there. The expression, therefore, “when I come,” must relate to a second visit; against which visit the contribution spoken of was desired to be in readiness. “Moreover, brethren, we do you to wit of the grace of God bestowed on the churches of Macedonia; how that in a great trial of affliction the abundance of their joy and their deep poverty abounded unto the riches of their liberality. For to their power, I bear record, yea, and beyond their power they were willing of themselves; praying us with much entreaty that we would receive the gift, and take upon us the fellow­ship of the ministering to the saints.” To which add, chap. 9 ver. 2: “I know the forwardness of your mind, for which I boast of you to them of Macedonia, that Achaia was ready a year ago.” In this epistle we find St. Paul advanced as far as Macedonia, upon that second visit to Corinth which he pro­mised in his former epistle: we find also, in the passages now quoted from it, that a contribution was going on in Macedonia at the same time with, or soon however following, the contri­bution which was made in Achaia; but for whom the con­tribution was made does not appear in this epistle at all: that information must be supplied from the first epistle. Here therefore, at length, but fetched from three different writings, we have obtained the several circumstances we in­quired after, and which the Epistle to the Romans brings together, namely, a contribution in Achaia for the Christians of Jerusalem; a contribution in Macedonia for the same; and an approaching journey of St. Paul to Jerusalem. We have these circumstances—each by some hint in the passage in which it is mentioned, or by the date of the writing in which the passage occurs—fixed to a particular time; and we have that time turning out, upon examination, to be in all the same, namely, towards the close of St. Paul’s second visit to the peninsula of Greece. This is an instance of conformity beyond the possi­bility, I will venture to say, of random writing to produce; I also assert, that it is in the highest degree improbable that it should have been the effect of contrivance and design. The imputation of design amounts to this: that the forger of the Epistle to the Romans inserted in it the passage upon which our observations are founded, for the purpose of giving colour to his forgery by the appearance of conformity with other writings which were then extant. I reply, in the first place, that if he did this to countenance his forgery, he did it for the purpose of an argument which would not strike one reader in ten thousand. Coincidences so circuitous as this answer not the ends of forgery; are seldom, I believe, attempted by it. In the second place, I observe that he must have had the Acts of the Apostles, and the two epistles to the Corinthians, before him at the time. In the Acts of the Apostles, (I mean that part of the Acts which relates to this period,) he would have found the journey to Jerusalem; but nothing about the contribution. In the first Epistle to the Corinth­ians he would have found a contribution going on in Achaia for the Christians of Jerusalem, and a distant hint of the pos­sibility of the journey; but nothing concerning a contribution in Macedonia. In the second Epistle to the Corinthians he would have found a contribution in Macedonia accompanying that in Achaia; but no intimation for whom either was intended, and not a word about the journey. It was only by a close and attentive collation of the three writings, that he could have picked out the circumstances which he has united in his epistle, and, by a still more nice examination, that he could have determined them to belong to the same period. In the third place, I remark, what diminishes very much the sus­picion of fraud, how aptly and connectedly the mention of the circumstances in question, namely, the journey to Jerusalem, and of the occasion of that journey, arises from the context: “Whensoever I take my journey into Spain, I will come to you; for I trust to see you in my journey, and to be brought on my way thitherward by you, if first I be somewhat filled with your company. But now I go unto Jerusalem to minister unto the saints. For it hath pleased them of Macedonia and Achaia to make a certain contribution for the poor saints which are at Jerusalem. It hath pleased them verily, and their debtors they are; for if the Gentiles have been made partakers of their spiritual things, their duty is also to minister unto them in carnal things. When therefore I have performed this, and have sealed to them this fruit, I will come by you into Spain.” Is the passage in Italics like a passage foisted in for an extra­neous purpose? Does it not arise from what goes before, by a junction as easy as any example of writing upon real busi­ness can furnish? Could anything be more natural than that St. Paul, in writing to the Romans, should speak of the time when he hoped to visit them; should mention the business which then detained him; and that he purposed to set forwards upon his journey to them, when that business was completed? * Of these Jason is one, whose presence upon this occasion is very naturally accounted for. Jason was an inhabitant of Thessalonica in Macedonia, and entertained St. Paul in his house upon his first visit to that country. Acts 17:7.—St. Paul, upon this his second visit, passed through Macedonia, on his way to Greece, and from the situation of Thessalonica, most likely through that city. It appears, from various instances in the Acts, to have been the practice of many converts to attend St. Paul from place to place. It is therefore highly probable, I mean that it is highly consistent with the account in the history, that Jason, according to that account a zealous disciple, the inhabitant of a city at no great distance from Greece, and through which, as it should seem, St. Paul had lately passed, should have accompanied St. Paul into Greece, and have been with him there at this time. Lucius is another name in the epistle. A very slight alteration would convert Λούκιος into Λουκᾶς, Lucius into Luke, which would produce an additional coincidence: for, if Luke was the author of the history, he was with St. Paul at the time; inasmuch as, describing the voyage which took place soon after the writing of this epistle, the historian uses the first person, “We sailed away from Philippi,” Acts 20:6. (a) It is here assumed that Gaius of Derbe and Gaius of Corinth were the same person; but it seems more probable that they were different, and it is even possible that Gaius the Macedonian might be distinct from both. No name, perhaps, was more frequent among the citizens of the Roman world. Even if Gaius of Derbe had afterwards settled in Macedonia, and was called a Macedonian from his abode, Acts 19:29, still it is clear that he could not be the same with the other Gaius, who was baptized by St. Paul at Corinth, and held an eminent place in the Corinthian church. We find, still later, another Gaius in the church at Ephesus. Again, it does not seem likely that Lucius is another name of St. Luke. In the first place, Luke is a contracted form of Lucanus, as Silas of Silvanus, and Lucius and Lucanus are two Roman names entirely distinct from each other, for one is a prœnomen and the other a surname. It is very unlikely that St. Paul would style the same person Lucius in this one epistle and Lucas in two others. And again, the history rather implies that St. Luke and the apostle met again at Philippi, and not at Corinth. But these corrections do not affect the force of Paley’s general argument in the above article.—EDITOR. But if any one shall still contend that a forger of the epistle, with the Acts of the Apostles before him, and having settled this scheme of writing a letter as from St. Paul upon his second visit into Greece, would easily think of the expedient of putting in the names of those persons who appeared to be with St. Paul at the time as an obvious recommendation of the imposture: I then repeat my observations; first, that he would have made the catalogue more complete; and, secondly, that with this contrivance in his thoughts, it was certainly his business, in order to avail himself of the artifice, to have stated in the body of the epistle that Paul was in Greece when he wrote it, and that he was there upon his second visit: neither of which he has done, either directly, or even so as to be dis­coverable by any circumstance found in the narrative delivered in the Acts. Under the same head, namely, of coincidences depending upon date, I cite from the epistle the following salutation: “Greet Priscilla and Aquila, my helpers in Christ Jesus: who have for my life laid down their own necks: unto whom not only I give thanks, but also all the churches of the Gentiles,” (chap. 16:3.) It appears from the Acts of the Apostles, that Priscilla and Aquila had ori­ginally been inhabitants of Rome; for we read, Acts 18:2, that Paul “found a certain Jew, named Aquila, born in Pontus, lately come from Italy, with his wife Priscilla; (because that Claudius had commanded all Jews to depart from Rome. )” They were connected, therefore, with the place to which the salutations are sent. That is one coin­cidence; another is the following: St. Paul became acquainted with these persons at Corinth during his first visit into Greece. They accompanied him upon his return into Asia; were settled for some time at Ephesus, Acts 18:19-26; and appear to have been with St. Paul when he wrote from that place his first Epistle to the Corinthians, 1 Cor. 16:19; not long after the writing of which epistle St. Paul went from Ephesus into Macedonia, and, “after he had gone over those parts,” proceeded from thence upon his second visit into Greece; during which visit, or rather at the conclusion of it, the Epistle to the Romans, as hath been shown, was written. We have therefore the time of St. Paul’s residence at Ephesus after he had written to the Corinthians, the time taken up by his progress through Macedonia, (which is indefinite, and was probably considerable,) and his three months’ abode in Greece; we have the sum of those three periods allowed for Aquila and Priscilla going back to Rome, so as to be there when the epistle before us was written. Now what this quotation leads us to observe is, the danger of scattering names and circum­stances in writings like the present, how implicated they often are with dates and places, and that nothing but truth can pre­serve consistency.· Had the notes of time in the Epistle to the Romans fixed the writing of it to any date prior to St. Paul’s first residence at Corinth, the salutation of Aquila and Priscilla would have contradicted the history, because it would have been prior to his acquaintance with these persons. If the notes of time had fixed it to any period during that residence at Corinth, during his journey to Jerusalem when he first returned out of Greece, during his stay at Antioch, whither he went down to Jerusalem, or during his second progress through the Lesser Asia, upon which he proceeded from Antioch, an equal contradiction would have been incurred; because from Acts 18:2-18, 19-26, it appears that during all this time Aquila and Priscilla were either along with St. Paul, or were abiding at Ephesus. Lastly, had the notes of time in this epistle, which we have seen to be perfectly incidental, compared with the notes of time in the first Epistle to the Corinthians, which are equally incidental, fixed this epistle to be either contemporary with that or prior to it, a similar contradiction would have ensued; because, first, when the Epistle to the Corinthians was written, Aquila and Pris­cilla were along with St. Paul, as they joined in the salutation of that church, 1 Cor. 16:19: and because, secondly, the his­tory does not allow us to suppose that between the time of their becoming acquainted with St. Paul and the time of St. Paul’s writing to the Corinthians, Aquila and Priscilla could have gone to Rome, so as to have been saluted in an epistle to that city; and then come back to St. Paul at Ephesus, so as to be joined with him in saluting the church of Corinth. As it is, all things are consistent. The Epistle to the Romans is posterior even to the second Epistle to the Corinthians; because it speaks of a contribution in Achaia being completed, which the second Epistle to the Corinthians, chap. 8:, is only soliciting. It is sufficiently, therefore, pos­terior to the first Epistle to the Corinthians to allow time in the interval for Aquila and Priscilla’s return from Ephesus to Rome. The two congruities last adduced depended upon the time, the two following regard the place, of the epistle. (b) See Horæ Apostolicæ, cap. v. No. III. for a more probable explanation of the phrase, which renders it a still more striking confirmation of the present argument.— ED. 1. Chap. 16:23. “Erastus, the chamberlain of the city, saluteth you”—of what city? We have seen, that is, we have inferred from circumstances found in the epistle, compared with circumstances found in the Acts of the Apostles, and in the two epistles to the Corinthians, that our epistle was written during St. Paul’s second visit to the peninsula of Greece. Again, as St. Paul, in his epistle to the church of Corinth, 1 Cor. 16:3, speaks of a collection going on in that city, and of his desire that it might be ready against he came thither; and as in this epistle he speaks of that collection being ready, it follows that the epistle was written either whilst he was at Corinth, or after he had been there. Thirdly, since St. Paul speaks in this epistle of his journey to Jerusa­lem, as about instantly to take place; and as we learn, Acts 20:3, that his design and attempt was to sail upon that jour­ney immediately from Greece, properly so called, that is, as distinguished from Macedonia; it is probable that he was in this country when he wrote the epistle, in which he speaks of himself as upon the eve of setting out. If in Greece, he was most likely at Corinth; for the two epistles to the Corinthians show that the principal end of his coming into Greece was to visit that city, where he had founded a church. Certainly we know no place in Greece in which his presence was so pro­bable; at least, the placing of him at Corinth satisfies every circumstance. Now that Erastus was an inhabitant of Corinth, or had some connexion with Corinth, is rendered a fair subject of presumption, by that which is accidentally said of him in the second Epistle to Timothy, chap. 4:20, “Erastus abode at Corinth.” St. Paul complains of his solitude, and is telling Timothy what was become of his companions: “Erastus abode at Corinth; but Trophimus have I left at Miletus sick.” Erastus was one of those who had attended St. Paul in his travels, Acts 19:22; and when those travels had upon some occasion, brought our apostle and his train to Corinth, Erastus stayed there, for no reason so probable as that it was his home. I allow that this coincidence is not so precise as some others, yet I think it too clear to be produced by acci­dent; for of the many places which this same epistle has assigned to different persons, and the innumerable others which it might have mentioned, how came it to fix upon Corinth for Erastus? And as far as it is a coincidence, it is certainly undesigned on the part of the author of the Epistle to the Romans: because he has not told us of what city Erastus was the chamberlain; or, which is the same thing, from what city the epistle was written, the setting forth of which was absolutely necessary to the display of the coincidence, if any such display had been thought of: nor could the author of the Epistle to Timothy leave Erastus at Corinth, from anything he might have read in the Epistle to the Ro­mans, because Corinth is nowhere in that epistle mentioned «either by name or description. 2. Chap. 16:1-3. “I commend unto you Phebe, our sister, which is a servant of the church which is at Cenchrea: that ye receive her in the Lord, as becometh saints, and that ye assist her in whatsoever business she hath need of you; for she hath been a succourer of many, and of myself also.” Cenchrea adjoined to Corinth; St. Paul, therefore, at the time of writing the letter, was in the neighbourhood of the woman whom he thus recommends. But, further, that St. Paul had before this been at Cenchrea itself, appears from the eighteenth chapter of the Acts; and appears by a circumstance as inci­dental, and as unlike design, as any that can be imagined. “Paul after this tarried there (namely, at Corinth) yet a good while, and then took his leave of his brethren, and sailed thence into Syria, and with him Priscilla and Aquila, having shorn his head in Cenchrea: for he had a vow,” (18:18.) The shaving of the head denoted the expiration of the Nazaritic vow. The historian, therefore, by the mention of this circumstance, vir­tually tells us that St. Paul’s vow was expired before he set forward upon his voyage, having deferred probably his depar­ture until he should be released from the restrictions under which his vow laid him. Shall we say that the author of the Acts of the Apostles feigned this anecdote of St. Paul at Cenchrea, because he had read in the Epistle to the Romans that “Phebe, a servant of the church of Cenchrea, had been a succourer of many, and of him also?” Or shall we say that the author of the Epistle to the Romans, out of his own ima­gination, created Phebe “a servant of the church of Cenchrea” because he read in the Acts of the Apostles that Paul had “shorn his head” in that place? Let it be observed, that our epistle purports to have been written at the conclusion of St. Paul’s second journey into Greece: that the quotation from the Acts contains words said to have been spoken by St. Paul at Ephesus, some time before he set forwards upon that journey. Now I contend that it is impossible that two independent fictions should have attributed to St. Paul the same purpose,—especially a purpose so specific and particular as this, which was not merely a general design, of visiting Rome after he had passed through Macedonia and Achaia, and after he had performed a voyage from these countries to Jerusalem. The conformity between the history and the epistle is perfect. In the first quotation, from the epistle, we find that a design of visiting Rome had long dwelt in the apostle’s mind: in the quotation from the Acts, we find that design expressed a considerable time before the epistle was written. In the history we find that the plan which St. Paul had formed was, to pass through Macedonia and Achaia; after that, to go to Jerusalem; and, when he had finished his visit there, to sail for Rome. When the epistle was written, he had executed so much of his plan, as to have passed through Macedonia and Achaia; and was pre­paring to pursue the remainder of it, by speedily setting out towards Jerusalem; and in this point of his travels he tells his friends at Rome that, when he had completed the business which carried him to Jerusalem, he would come to them. Secondly, I say that the very inspection of the passages will satisfy us that they were not made up from one another. “Whensoever I take my journey into Spain, I will come to you: for I trust to see you in my journey, and to be brought on my way thitherward by you.—But now I go up unto Jeru­salem, to minister unto the saints.—When therefore I have performed this, and have sealed to them this fruit, I will come by you into Spain.”—This from the epistle. “Paul purposed in the spirit, when he had passed through Macedonia and Achaia, to go to Jerusalem, saying, After I have been there, I must also see Rome.”—This from the Acts. If the passage in the epistle was taken from that in the Acts, why was Spain put in? If the passage in the Acts was taken from that in the epistle, why was Spain left out? If the two passages were unknown to each other, nothing can account for their conformity but truth. Whether we suppose the history and the epistle to be alike fictitious, or the history to be true but the letter spurious, or the letter to be genuine but the history a fable, the meeting with this circumstance in both, if neither borrowed it from the other, is, upon all these suppositions, equally inexplicable. (c.) Compare Horæ Apostolicæ cap. v. No. II.—ED. I do not think that these words necessarily import that St. Paul had penetrated into Illyricum, or preached the gospel in that province; but rather that he had come to the confines of Illyricum (μέχρι τοῦ Ιλλυρικοῦ), and that these confines were the external boundary of his travels. St. Paul considers Jeru­salem as the centre, and is here viewing the circumference to which his travels extended. The form of expression in the original conveys this idea—άπὸ Ἰερουσαλὴμ καὶ κύκλψ μέχρι τοῦ Ἰλλυρικοῦ. Illyricum was the part of this circle which he mentions in an epistle to the Romans, because it lay in a direction from Jerusalem towards that city, and pointed out to the Roman readers the nearest place to them, to which his travels from Jerusalem had brought him. The name of Illyricum nowhere occurs in the Acts of the Apostles; no suspicion therefore, can be received that the mention of it was borrowed from thence. Yet I think it appears, from these same Acts, that St. Paul, before the time when he wrote his Epistle to the Romans, had reached the confines of Illyricum; or, however, that he might have done so, in perfect consistency with the account there delivered. Illyricum adjoins upon Macedonia; measuring from Jerusalem towards Rome, it lies close behind it. If, therefore, St. Paul traversed the whole country of Macedonia, the route would necessarily bring him to the confines of Illyricum, and these confines would be described as the extremity of his journey. Now the account of St. Paul’s second visit to the peninsula of Greece is contained in these words: “He departed for to go into Macedonia. And when he had gone over those parts, and had given them much exhortation, he came into Greece.” (Acts 20:2.) This account allows, or rather leads us to sup­pose, that St. Paul, in going over Macedonia (διελθὼν τὰ μέρη ἐκεἴνα), had passed so far to the west, as to come into those parts of the country which were contiguous to Illyricum, if he did not enter into Illyricum itself. The history, therefore, and the epistles so far agree, and the agreement is much strengthened by a coincidence of time. At the time the epistle was written, St. Paul might say, in conformity with the his­tory, that he had “come into Illyricum;” much before that time, he could not have said so; for, upon his former journey to Macedonia, his route is laid down from the time of his landing at Philippi to his sailing from Corinth. We trace him from Philippi to Amphipolis and Apollonia; from thence to Thessalonica; from Thessalonica to Berea; from Berea to Athens; and from Athens to Corinth: which track confines him to the eastern side of the peninsula, and therefore keeps him all the while at a considerable distance from Illyricum. Upon his second visit to Macedonia, the history, we have seen, leaves him at liberty. It must have been, therefore, upon that second visit, if at all, that he approached Illyricum; and this visit, we know, almost immediately preceded the writing of the epistle. It was natural that the apostle should refer to a journey which was fresh in his thoughts. Let it be remarked, that it is the same journey to Jerusalem which is spoken of in these two passages; that the epistle was written immediately before St. Paul set forwards upon this journey from Achaia; that the words in the Acts were uttered by him when he had proceeded in that journey as far as Miletus, in Lesser Asia. This being remembered, I observe that the two passages, without any resemblance between them that could induce us to suspect that they were borrowed from one another, represent the state of St. Paul’s mind, with respect to the event of the journey, in terms of substantial agreement. They both express his sense of danger in the approaching visit to Jerusalem: they both express the doubt which dwelt upon his thoughts concerning what might there befall him. When, in his epistle, he entreats the Roman Christians, “for the Lord Jesus Christ’s sake, and for the love of the Spirit,” to strive together with him in their prayers to God for him, that he might “be delivered from them that do not believe in Judæa,” he sufficiently confesses his fears. In the Acts of the Apostles we see in him the same apprehen­sions, and the same uncertainty: “I go bound in the spirit unto Jerusalem, not knowing the things that shall befall me there.” The only difference is, that in the history his thoughts are more inclined to despondency than in the epistle. In the epistle he retains his hope “that he should come unto them with joy by the will of God:” in the history, his mind yields to the reflection, “that the Holy Ghost witnesseth in every city that bonds and afflictions awaited him.” Now that his fears should be greater, and his hopes less, in this stage of his journey than when he wrote his epistle, that is, when he first set out upon it, is no other alteration than might well be expected; since those prophetic intimations to which he refers, when he says, “the Holy Ghost witnesseth in every city,” had probably been received by him in the course of his journey, and were probably similar to what we know he received in the remaining part of it at Tyre, 21:4; and afterwards from Agabus at Cæsarea, 21:11. This single consideration convinces me, that no concert or confederacy whatever subsisted between the epistle and the Acts of the Apostles; and that whatever coincidences have been or can be pointed out between them are unsophisticated, and are the result of truth and reality. It also convinces me that the epistle was written not only in St. Paul’s lifetime, but before he arrived at Jerusalem; for the important events relating to him which took place after his arrival at that city must have been known to the Christian community soon after they happened: they form the most public part of his history. But had they been known to the author of the epistle—in other words, had they then taken place—the passage which we have quoted from the epistle would not have been found there. (d) The contrast between the prayer and hope of St. Paul and the actual event is here stated rather too strongly. He was really delivered from the murderous malice of his countrymen, and arrived at Rome in safety, where he was refreshed by the company of the Roman Christians; still it is true that his tumultuous apprehension, long imprisonment, his shipwreck, and arrival as a prisoner at Rome, were very unlike the fulfilment of those prayers which he here desires them to offer. Those prayers were not really frustrated, but they were fulfilled in a manner very different from the hopes both of the apostle and of the Roman Christians.—ED. I now proceed to state the conformity which exists between the argument of this epistle and the history of its reputed author. It is enough for this purpose to observe, that the object of the epistle, that is, of the argumentative part of it, was to place the Gentile convert upon a parity of situation with the Jewish, in respect of his religious condition, and his rank in the Divine favour. The epistle supports this point by a variety of arguments; such as, that no man of either de­scription was justified by the works of the law—for this plain reason, that no man had performed them; that it became therefore necessary to appoint another medium or condition of justification, in which new medium the Jewish peculiarity was merged and lost; that Abraham’s own justification was anterior to the law, and independent of it; that the Jewish converts were to consider the law as now dead, and them­selves as married to another; that what the law in truth could not do, in that it was weak through the flesh, God had done by sending his Son; that God had rejected the unbe­lieving Jews, and had substituted in their place a society of believers in Christ, collected indifferently from Jews and Gentiles. Soon after the writing of this epistle, St. Paul, agree­ably to the intention intimated in the epistle itself, took his journey to Jerusalem. The day after he arrived there, he was introduced to the church. What passed at this interview is thus related, Acts 21:19-21: “When he had saluted them, he declared particularly what things God had wrought among the Gentiles by his ministry: and, when they heard it, they glorified the Lord; and said unto him, Thou seest, bro­ther, how many thousands of Jews there are which believe; and they are all zealous of the law: and they are informed of thee, that thou teachest all the Jews which are among the Gentiles to forsake Moses, saying, that they ought not to cir­cumcise their children, neither to walk after the customs.” St. Paul disclaimed the charge; but there must have been something to have led to it. Now it is only to suppose that St. Paul openly professed the principles which the epistle contains; that, in the course of his ministry, he had uttered the sentiments which he is here made to write; and the mat­ter is accounted for. Concerning the accusation which public rumour had brought against him to Jerusalem, I will not say that it was just; but I will say, that if he was the author of the epistle before us, and if his preaching was consistent with his writing, it was extremely natural: for though it be not a necessary, surely it is an easy inference, that if the Gentile convert, who did not observe the law of Moses, held as advantageous a situation in his religious interests as the Jewish convert who did, there could be no strong reason for observing that law at all. The remonstrance therefore of the church of Jerusalem, and the report which occasioned it, were founded in no very violent misconstruction of the apostle’s doctrine. His reception at Jerusalem was exactly what I should have expected the author of this epistle to have met with. 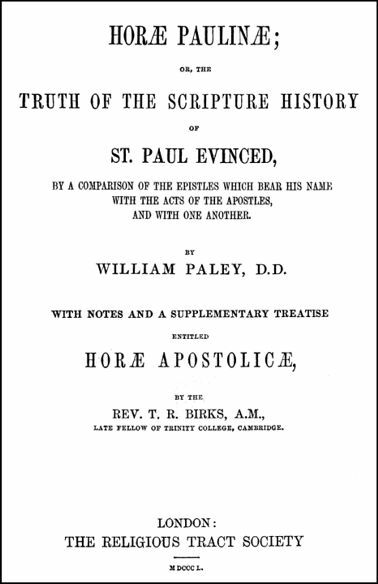 I am entitled therefore to argue, that a separate narrative of effects experienced by St. Paul, similar to what a person might be expected to experience who held the doctrines advanced in this epistle, forms a proof that he did hold these doctrines; and that the epistle bearing his name, in which such doctrines are laid down, actually proceeded from him.